Our bodies depend on water to survive and every part of our body needs water to work correctly. For example, your body uses water to maintain its temperature, remove waste, and lubricate joints. Water is needed for good health and it makes up more than half of our body weight. As we age, our brains may not be able to sense dehydration and send the signals for thirst. For this reason, it is very important to stay hydrated. This does not mean we must drink 6-8 glasses of water every day. Other drinks and foods can help us stay hydrated. Drinks like fruit and vegetable juices, milk, and herbal teas can contribute to the amount of water we get each day. 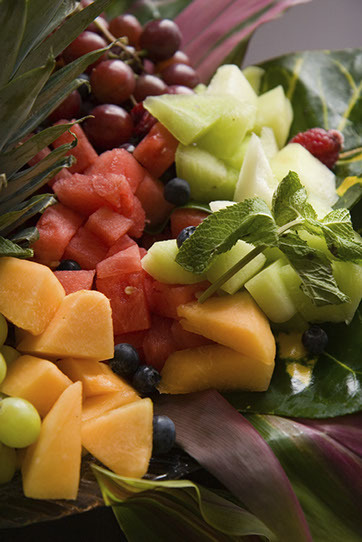 Water can also be found in fruits and vegetables (for example, watermelon, tomatoes, and lettuce)and in soup broths. Even decaffeinated drinks (for example, coffee, tea, and soda)can contribute to your daily water intake. A moderate amount of caffeine (200 to300 milligrams) is not harmful for most people. Soups are a great way to hydrate. 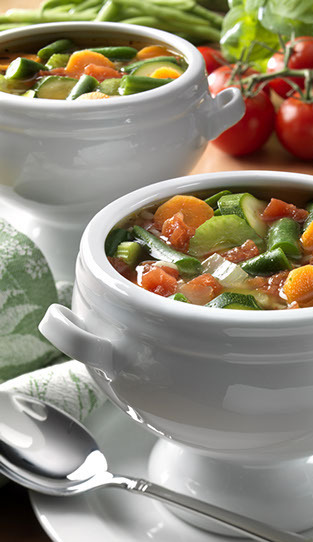 Try drinking a light vegetable soup as a snack in the mid-morning or afternoon to boost your water intake and energy levels.You can use high water content vegetables such as celery, cucumber, iceberg lettuce, tomato and zucchini and blend together for a tasty, hydrating soup to sip on all day. Be sure to adjust accordingly if you are monitoring your sodium level. Apple sauce, yogurt, ice cream, and nutritional supplements, such as Ensure or Boost are also hydrating alternatives; however, these choices do increase caloric intake so talk with your doctor about how much is a safe amount to consume on a daily basis. If you are concerned that you are not drinking enough water, check your urine. If your urine is consistently colorless or light yellow, you are most likely staying well hydrated. Dark yellow or amber-colored urine is a sign of dehydration. A good way to stay hydrated is by keeping a drink with you throughout the day. Any time you think about your drink, take a sip. These little sips will add up quickly throughout the day and help to keep you hydrated. If you believe you are suffering from dehydration, talk with your doctor aboutother options for staying hydrated or possible medical conditions leading to dehydration.